Embark on an adventure of a lifetime with an origin trip to Haiti’s coffee lands. Haiti was the world’s third largest coffee producer in 1949. After decades of dormancy, Singing Rooster, a social enterprise nonprofit, has been working directly with farmers since 2009. 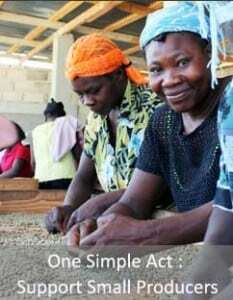 Together, we’re putting Haiti’s reputation back on the world’s coffee map. Join us on a tour of Haiti’s coffee mecca, Thiotte, where you’ll visit family farms, farmer-owned processing centers, and experience rural Haiti. This tour provides insight into something rare– where getting there is half the fun. 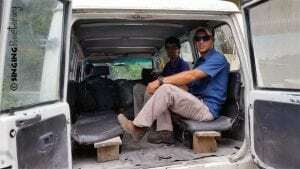 Trip Guide: Justin Dena is Singing Rooster’s Director of Business Development and is an experienced traveler in Haiti. He is certified as an EMT and is a Marine Corps Veteran. 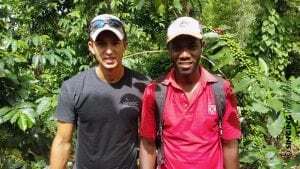 He’s a nice respectful guy — full of curiosity with insight and advocacy for Haitian farmers. He will make your trip worthwhile! Travel Dates: Late summer/early fall 2019 + January 2020. Like us on Facebook or follow Singing Rooster on instagram to learn about trip dates. Day 1: Friday arrival in Port au Prince. Shared evening meal at local hotel: introductions, trip details, overview of Haiti including learning creole phrases. Day 2: Saturday begins with an early breakfast, then departure. Tour Singing Rooster’s coffee roastery and processing center on the way out of town. Embark on a 4 hour drive over 80 miles of rough terrain. Stop at the Pine Forest Saturday Market (something you’ll never forget). Visit farmer co-op processing station after a late lunch. Overnight in Thiotte. Day 3: Sunday begins w/ a tour of Singing Rooster’s demonstration farms: see how coffee grows and is transforming Haiti’s bare mountain landscape. Includes hiking on small, rocky (and occasionally slippery) paths. Good shoes & attitude required. Day 4: Monday tour a family farm. Visit local farmer co-ops, nursery, roastery, & facility. Day 5: Wednesday morning, we’ll head back to Croix des Bouquets (12 km from Port au Price) where we’ll check into hotel. 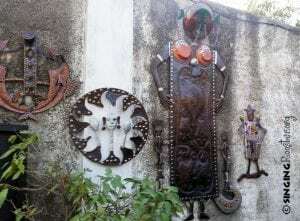 Visit the fabulous metal art district. Day 6: Wednesday visit Haiti’s largest waterfall, Salt Eau. Evening meal together. Day 7: Thursday morning debriefing over breakfast. Travel to airport. lots of creole chicken, rice & beans! Please note: traveling 80 miles to the destination is slow-going, bumpy, and tiring. Have a good back? Like sitting really close to strangers (who quickly become great friends)? This trip is for you. There is a lot to see along the way, and it’s a grand adventure. 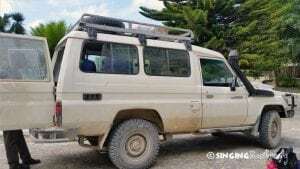 We’ll travel in a Toyota land cruiser that has 2 benches for seating. We’ll draw a lottery for the front seat! We’ll stop along the way to stretch legs and take photos. Experienced, trusted driver. What to bring: we’ll email you a travel checklist. We want you to love Haiti as much as we do. When we travel in small groups to places off the map – it changes us — how we think, interact. It inspires us in ways unanticipated. Join us. Keelia Trively, Singing Rooster’s social media maven went on Singing Rooster’s coffee lands trip and shared her journal in a blog.